The Michael Michael Kors Hamilton North South Tote Bag in tan or black leather from my-wardrobe.com, is embellished with chunky, shiny gold coloured hardware throughout. The bag has two top handles, a chain and leather shoulder strap, a key fob and a leather strap around the top with a branded padlock, and a top magnetic stud fastening. The bag is fully lined with four slip pockets, a zip pocket and a key fob. There are also studs on the base of the bag to protect it. This is the timeless Hamilton, the iconic Michael by Michael Kors bag which is craved by city girls and professional women everywhere. 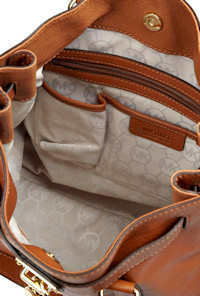 The bag is spacious with lots of pockets, and the chunky hardware gives it a really luxurious edge. This bag is a style classic which will garner you compliments for years to come. This SS2012 version of the Michael by Michael Kors East West Hamilton Bag is made from black leather and embellished with polished gold-tone hardware throughout. The bag has two structured top handles and a separate chain and leather shoulder strap.The bag fastens with a top magnetic stud fastening. 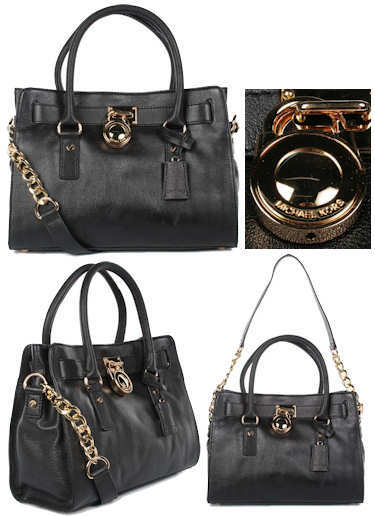 Features which define the Hamilton style include the branded Michael Kors padlock on the front of the bag, and the key, contained in the leather luggage hang tag. Inside, the bag is lined in signature MK print fabric; like many Michael Kors handbags, the bag is thoughtfully set out inside – there is a zip pocket, several pouch pockets and a key fob attachment with a lobster clasp fastening. Style note: This bag is slightly smaller than the Hamilton Tote, but has all the same features. It’s perfect if you love the Hamilton style but prefer a slightly more compact shape. Team it with all your day wear outfits for a touch of luxury every day. The new SS2012 season’s East West Hamilton satchel by Michael by Michael Kors is made from leather with an all over ostrich texturing. The bag, available in tan leather or red leather, feature chunky gold-tone hardware throughout, including the branded padlock on the front. The key for the padlock is concealed in the leather tag – see inset photo. The bag has two structured grab handles and a chunky chain and leather strap for carrying it over your shoulder. The single main compartment has a magnetic fastening at the top. Inside, the bag is lined in signature pale grey MK print fabric; there is a zip fastening pocket on one side with the Michael by Michael Kors branded leather label – on the opposite side there are numerous slip pockets and a mobile phone pocket, plus a key fob attachment. The base of the bag is studded to provide protection from scratches. Style note: This bag has been updated for the new season with a fabulous ostrich embossed and two rich colours which give the bag a really luxe appearance. Michael Kors handbags are generally well organised with pockets and these two bags are no exceptions. Details like the branded padlock on the front, the cute key and that luscious chain detail on the shoulder strap are what makes Michael by Michael Kors handbags so desirable. This bag is delivered with a dust bag for protection. This Michael by Michael Kors Ostrich Hamilton Tote in leather with an all over ostrich finish is A4 in sized, which means that it’s a great size to carry A4 files, documents and even magazines, making it the perfectly stylish business and casual use handbag. With polished gold coloured metal hardware throughout, including the chunky chain and leather shoulder strap, the padlock on the front and the key concealed in the leather tag, this bag has a luxurious edge. In addition to the shoulder strap, the bag also has two rolled leather structured top grab handles. Inside, the bag is lined with a signature light grey branded fabric and the bag has a zip pocket, numerous slip pockets, a mobile phone pocket and a key fob attachment. There are studs on the base to protect the bag from scratches. Style note: This classic Michael by Michael Kors style is now available for the new season in a stylish ostrich print, which give it a certain je ne sais quoi. Great for work or play, this is the ideal bag for city girls anywhere. The Michael by Michael Kors Black Hamilton 18K Tote is a spacious black leather tote bag with gold coloured metal hardware throughout. It has a top magnetic fastening, two rolled leather top handles and a separate chain and leather shoulder strap. The bag is embellished with a gold tone padlock at the front, and there is a leather tag hanging from one of the handles which contains the key. The bag has lots of pockets inside – five in total, one of which is zip fastening, the others open. It also has a key fob. It is lined in beige MK logo fabric. In addition to the two chain handles, the bag has a leather cross body / shoulder strap. Style note: This is a classic style of tote bag that is on trend for this season and many seasons to come. It is luxuriously embellished with gold coloured hardware, and like many Michael Kors bags, has lots of pockets to help keep everything organised, so it would be great for daily use. 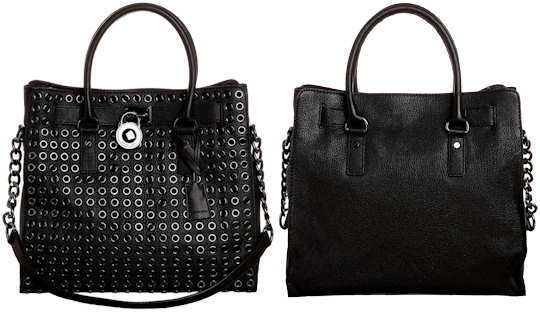 Michael Kors has introduced two new grommet embellished bags for new season. They are the Michael by Michael Kors Hamilton Grommet Bag and the Michael by Michael Kors Grayson Grommet Bag. The Michael by Michael Kors Hamilton Bag, pictured above, is a classic Michael Kors handbag which is reintroduced each season in different colours and textures of leather. The Grommet version is embellished to the front of the bag with hundreds of silver tone or gold tone grommets. All the metal work on the bag is the same colour, including the chunky branded padlock on the front and the chunky chain accents to the leather shoulder strap. In addition to the shoulder strap, the bag has two rolled leather top handles; it also has a leather tag hanging from one of the handles which contains the key to the padlock. The bag has a top magnetic fastening. Inside, it is lined with signature print Michael by Michael Kors satin fabric. The single compartment is spacious, and has a zip fastening pockets and several pouch pockets including one for a mobile phone. The Michael by Michael Kors Hamilton Bag, pictured right, is another classic Michael Kors handbag which has been restyled for the new season with grommets. On this version of the bag, the grommets cover both the front and the back of the bag. All the metal hardware on these bags is gold coloured, and they have the MK circular charm attached by a leather thong to the bag. The inside is lined in branded satin fabric and there is a zip pocket and lots of pouch pockets inside. This bag has a zip top fastening, two adjustable grab handles and a removable and adjustable cross body / shoulder strap.